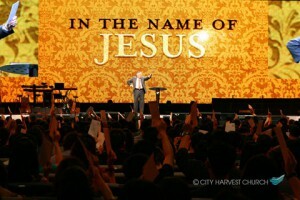 On Sunday, Geenu and I attended City Harvest Church at Singapore Expo Hall 1. The service started at 10 am with beautiful praise and worship. The anointing was powerful during the worship. After worship, Dr. John Avanzini preached the message on “Power in the Name of Jesus”. He quoted the verses from Jeremiah 12: 5 and Psalm 20:7. Then how will you do in the floodplain[a] of the Jordan? When the troubles hits, remember the name of the Lord. It was because of fight with Goliath, David became king of Israel else he would have been only a shepherd boy. Similarly, Joseph would never have been in the top position in Egypt if his brothers had not sold him off as slave. “There is nothing to be called as overcomers if we don’t have anything to overcome” quoted Dr. John Avanzini. There is power in the name of Jesus. Using this name, you can overcome the mountains that you face in your life. There is healing in the name of Jesus. 2 And a certain man lame from his mother’s womb was carried, whom they laid daily at the gate of the temple which is called Beautiful, to ask alms from those who entered the temple; 3 who, seeing Peter and John about to go into the temple, asked for alms. 4 And fixing his eyes on him, with John, Peter said, “Look at us.” 5 So he gave them his attention, expecting to receive something from them. 6 Then Peter said, “Silver and gold I do not have, but what I do have I give you: In the name of Jesus Christ of Nazareth, rise up and walk.” 7 And he took him by the right hand and lifted him up, and immediately his feet and ankle bones received strength. 8 So he, leaping up, stood and walked and entered the temple with them—walking, leaping, and praising God. 9 And all the people saw him walking and praising God. You must learn how to use the name of Jesus to place the things in order that you desire in your life. 8 Then Peter, filled with the Holy Spirit, said to them, “Rulers of the people and elders of Israel: 9 If we this day are judged for a good deed done to a helpless man, by what means he has been made well, 10 let it be known to you all, and to all the people of Israel, that by the name of Jesus Christ of Nazareth, whom you crucified, whom God raised from the dead, by Him this man stands here before you whole. When the name of Jesus was given, You are granted the power of attorney to do everything that only Jesus could do. 12 “Most assuredly, I say to you, he who believes in Me, the works that I do he will do also; and greater works than these he will do, because I go to My Father. 13 And whatever you ask in My name, that I will do, that the Father may be glorified in the Son. 14 If you ask[a] anything in My name, I will do it. John Avanzini encouraged people to speak the things that you desire in the Name of Jesus. God has granted you the power of attorney to do anything that Jesus has done. You have been commissioned to do great things under the power in the name of Jesus. You’re a favored people. There is gonna be a wealth tranfer for evangelization. For the sake of Jesus, we must be willing to lay down our lives. 16 Then the man in whom the evil spirit was leaped on them, overpowered[b] them, and prevailed against them,[c] so that they fled out of that house naked and wounded. From the above verse, we conclude that we must be careful in using the name of Jesus. Only the believers have the power of attorney. The name of Jesus must be spoken with great respect and not in a casual talk. Use your power of attorney, use it for healing. What’s that you want to happen in your life, is it for your marriage problem, your finances? In the name of Jesus, promotion will come, we will not be affected by unemployment, deliverance will come. There has to be a people that can speak the name of Jesus with Authority. Finally, Dr John Avanzini ended the sermon by encouraging people to sow a sacrificial seed for the Gospel. The service finally ended with a beautiful praise song. After service, we had lunch at Changi Point and did some shopping. This entry was posted in City Harvest Church and tagged City Harvest Church, Dr John Avanzini. Bookmark the permalink.